Pass in ITC/ITI/NAC in Mechanic (Motor Vehicle) /Diesel Mechanic/Auto Electrician/Welder/ Sheet Metal Worker/Electronic Mechanic/Upholstery/Draftsman(Mechanical)/ Fitter/ Machinist/ Tyre fitting/ Vulcanizing/Painting/Refrigeration and Air Conditioning/ Turner/ Automobile/ Electrical/Electronics/ Fabrication (Fitting & Welding) from an institution recognized by way of the Technical Board/ or the Government after a pass in secondary board education. For GEN 800/- Pay Examination rate via Debit/credit score card or Net Banking OR Computerised Post Offices. Interested Candidates may also observe Online via the internet site www.Ksrtcjobs.Com shape 05.04.2018 to 25.04.2018. For Assistant Traffic Officer - A Post Graduate in MBA in Transposition/ Marketing/MSW. For Assistant Mechanical Engineer - Degree in Automobile/Mechanical Enginreeing from a recognized University. Application Fee - General & / 2A, 2B, 3A, 3B Candidates have to pay Rs. 800/- and Rs.400/- for SC, ST, Cat-1, Ex-Serviceman candidates through Challan in Post Offices Only. How to Apply -Interested Candidate should apply Online through website www.ksrtcjobs.com from 17.01.2017 to 31.01.2017. 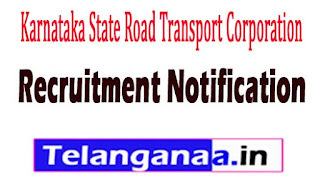 Karnataka State Road Transport Corporation (KSRTC) invites application for the post of 1113 Assistant Accountant, Assistant Traffic Inspector, Assistant Store Keeper, Statistical Assistant, Artisan Craftsman, Auto Electrician & Technical Assistant in Various Division in Karnataka. Apply Online before 04 February 2016. For Assistant Accountant - A Bachelor Degree in Commerce three years Course from a university established by Law. [ B.Com]. For Assistant Traffic Inspector - A Pass in PreUniversity examination in First Class. [ PUC ]. For Assistant Store Keeper - A Pass in three years Diploma in Mechanical/Automobile Engineering from Recognized institution. For Statistical Assistant - A Bachelor Degree in Statistics or BCA or Bsc Computer science three years Course. For Artisan Craftsman - Diploma in Mechanical / Automobile / Welding / Sheet metal technology Engineering. For Auto Electrician - Diploma in Electrical / Electrical & Electronics / Mechatronics / Refrigeration and Air Conditioning. For Technical Assistant - ITI. Application Fee - General & / 2A, 2B, 3A, 3B Candidates have to pay application fee in Rs. 400/- and for SC, ST, Cat-1, Ex-Serviceman candidates Rs.200/- through Challan in Post Offices Only. How to Apply - Interested Candidate should apply Online through website www.ksrtcjobs.com from 14.01.2016 to 04.02.2016.